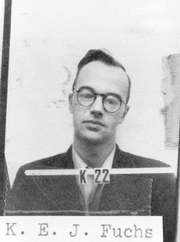 Klaus Fuchs, arguably the most important of the identified "atomic spies" for his extensive access to high-level scientific data and his ability to make sense of it through his technical training. "Atomic spies" or "atom spies" were people in the United States, Great Britain, and Canada who are known to have illicitly given information about nuclear weapons production or design to the Soviet Union during World War II and the early Cold War. Exactly what was given, and whether everyone on the list gave it are still matters of some scholarly dispute, and in some cases, what were originally seen as strong testimonies or confessions were admitted as fabricated in later years. Their work constitutes the most publicly well-known and well-documented case of nuclear espionage in the history of nuclear weapons. There was a movement among nuclear scientists to share the information with the world scientific community, but it was firmly quashed by the U.S. government. Confirmation about espionage work came from the Venona project, which intercepted and decrypted Soviet intelligence reports sent during and after World War II. They provided clues to the identity of several spies at Los Alamos and elsewhere, some of whom have never been identified. Some of this information was available but not usable in court for secrecy reasons during the 1950s trials. Additionally, records from Soviet archives, which were briefly opened to researchers after the fall of the Soviet Union, included more information about some spies. Before World War II, the theoretical possibility of nuclear fission occasioned intense discussion among leading physicists world-wide. Scientists from the Soviet Union were later recognized for their contributions to the understanding of a nuclear reality, and won several Nobel Prizes. Soviet scientists such as Igor Kurchatov, L. D. Landau, and Kirill Sinelnikov helped establish the idea of, and prove the existence of, a splittable atom. Dwarfed by and lost in the scale of the Manhattan Project, the significance of the Soviet contributions is rarely understood or credited outside of the field of physics. According to several sources, it was understood on a theoretical level that the atom provided for extremely powerful and novel releases of energy, and could possibly be utilized in the future for military purposes. In recorded comments, the physicists themselves lamented over their inability to achieve any kind of practical application from the discoveries. This would show that the scientists thought the creation of an atomic weapon was a pipe-dream and untenable. According to a US Congressional joint committee, although the scientists could conceivably have been first to generate a man-made fission reaction, in reality they lacked the ambition, funding, engineering capability, leadership, and ultimately, the capability to do so. The undertaking would be of an unimaginable scale, and the resources required to engineer for such use as a nuclear bomb, and nuclear power were deemed too great to pursue. At the urging of Albert Einstein and Leo Szilard through their Einstein–Szilárd letter of August 2, 1939, the United States - in collaboration with Britain and Canada - recognized the potential significance of an atomic bomb and embarked in 1942 upon work to achieve a usable device. Estimates suggest that during the quest to create the atomic bomb $2 billion, eighty-six thousand tons of silver, and twenty-four thousand skilled workers drove the research-and-development phase of the project. Those skilled workers included the people to maintain and operate the machinery necessary for research. The largest Western facility had five hundred scientists working on the project, as well as a team of fifty to derive the equations for the cascade of neutrons required to drive the reaction. The fledgling equivalent Soviet program was quite different: the program consisted of fifty scientists, and a mere two mathematicians trying to work out the equations for the particle cascade. The research and development of techniques to produce sufficiently enriched uranium and plutonium were beyond the scope and efforts of the Soviet group. The knowledge of techniques and strategies which the Allied programs used - and of which Soviet espionage obtained - might have played a role in the rapid development of the Soviet bomb after the war. The research and development of methods suitable for doping and separating the highly reactive isotopes needed to create the payload for a nuclear warhead took years, and consumed a vast amount of resources. The United States and Great Britain dedicated their best scientists to this cause and constructed three plants, each with a different isotope-extraction method. The Allied program decided to use gas-phase extraction to obtain the pure uranium necessary for an atomic detonation. Using this method, it took large quantities of uranium ore and other rare materials such as graphite to successfully purify the U-235 isotope. The quantities required for the development were also beyond the scope and purview of the Soviet program. The Soviet Union did not have natural uranium-ore mines at the start of the nuclear arms race. A lack of materials made it very difficult to conduct novel research or to map out a clear pathway to achieving the fuel they needed. The Soviet scientists became frustrated with the difficulties of producing uranium fuel cheaply, and they found their industrial techniques for refinement lacking. The use of information stolen from the Manhattan Project eventually rectified the problem. Without such information, the problems the Soviet atomic team experienced would have taken many years to correct, affecting the production of a Soviet atomic weapon significantly. The missing link that explains the great leaps in the Soviets Union's atomic program is the espionage information and technical data which Moscow succeeded in obtaining from the Manhattan Project. Once the Soviets had learned of the American plans to develop an atomic bomb during the 1940s, Moscow began actively seeking agents to get information. Moscow sought very specific information from its intelligence cells in America, and demanded updates on the progress of the Allied project. Moscow was also greatly concerned with the procedures being used for U-235 separation, what method of detonation was being used, and what industrial equipment was being used for these techniques. To obtain this information from the Manhattan Project, the Soviet Union needed spies who had security clearance high enough to have access to classified information and who could understand and interpret what they were stealing. Moscow also needed reliable spies who believed in the communist cause and who would provide accurate information. One such Soviet spy, Theodore Hall, had worked on the development of the bombs dropped in Japan. Hall provided the specifications of the bomb dropped on Nagasaki. This information allowed the Soviet scientists a first-hand look at the successful set up of an atomic weapon built by the Manhattan Project. Although Hall's information proved helpful to the Soviet cause, the most influential of the atomic spies was Klaus Fuchs. Fuchs, a German-born British physicist, went to America to work on the atomic project and became one of its lead scientists. Fuchs had become a member of the Communist Party in 1932 while still a student in Germany. At the onset the Third Reich Fuchs fled to Great Britain (1933), where he eventually became one of the lead nuclear physicists in the British program. In 1943 he moved to the United States to collaborate on the Manhattan Project. Due to Fuchs's position in the atomic program, he had access to most, if not all, of the material Moscow desired. Fuchs was also able to interpret and understand the information he was stealing, which made him an invaluable resource. Fuchs provided the Soviets with detailed information on the gas-phase separation process. He also provided specifications for the payload, calculations and relationships for setting of the fission reaction, and schematics for labs producing weapons-grade isotopes. This information helped the smaller under-manned and under-supplied Soviet group with a hard push in the direction of the successful detonation of a nuclear weapon. The Soviet nuclear program would have eventually been able to develop a nuclear weapon without the aid of espionage. But a basic understanding of the usefulness of an atomic weapon, the sheer resources, and the talent did not develop until much later. Espionage helped the Soviet scientists identify which methods worked and prevented wasting valuable resources on techniques which the development of the American bomb had proven ineffective. The speed at which the Soviet nuclear program achieved a working bomb with so few resources depended on the amount of information acquired through espionage. During the Cold War trials that espionage was touted as one of the most significant intelligence coups in human history. 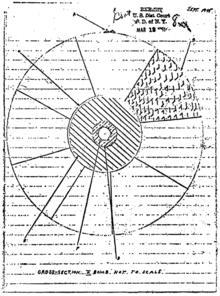 Sketch of an implosion-type nuclear weapon design made by David Greenglass as state's evidence, illustrating what he gave the Rosenbergs to pass on to the Soviet Union. Morris Cohen – an American, "Thanks to Cohen, designers of the Soviet atomic bomb got piles of technical documentation straight from the secret laboratory in Los Alamos," the newspaper Komsomolskaya Pravda said. Morris and his wife, Lona, served eight years in prison, less than half of their sentences before being released in a prisoner swap with the Soviet Union. He died without revealing the name of the American scientist who helped pass vital information about the United States atomic bomb project. Klaus Fuchs – the German-born British theoretical physicist who worked with the British delegation at Los Alamos during the Manhattan Project. After Fuchs' confession, there was a trial that lasted less than 90 minutes, Lord Goddard sentenced him to fourteen years' imprisonment, the maximum for violating the Official Secrets Act. He escaped the charge of espionage because of the lack of independent evidence and because, at the time of his activities, the Soviet Union was not an enemy of Great Britain. In December 1950 he was stripped of his British citizenship. He was released on June 23, 1959, after serving nine years and four months of his sentence at Wakefield prison. He was allowed to emigrate to Dresden, then in the German Democratic Republic. Harry Gold – an American, confessed to acting as a courier for Greenglass and Fuchs. He was sentenced in 1951 to thirty years imprisonment. He was paroled in May 1966, after serving just over half of his sentence. David Greenglass – an American machinist at Los Alamos during the Manhattan Project. Greenglass confessed that he gave crude schematics of lab experiments to the Russians during World War II. Some aspects of his testimony against his sister and brother-in-law (the Rosenbergs, see below) are now thought to have been fabricated in an effort to keep his own wife, Ruth, from prosecution. Greenglass was sentenced to 15 years in prison, served 10 years, and later reunited with his wife. Theodore Hall – an American, the youngest physicist at Los Alamos who gave a detailed description of the Fat Man plutonium bomb, and of several processes for purifying plutonium, to Soviet intelligence. His identity as a spy was not revealed until very late in the 20th century. He was never tried for his espionage work, though he admitted to it in later years to reporters and to his family. George Koval – the American-born son of a Belorussian emigrant family that returned to the Soviet Union where he was inducted into the Red Army and recruited into the GRU intelligence service. He infiltrated the US Army and became a radiation health officer in the Special Engineering Detachment. Acting under the code name Delmar he obtained information from Oak Ridge National Laboratory and the Dayton Project about the Urchin detonator used on the Fat Man plutonium bomb. His work was not known to the west until he was posthumously recognized as a hero of the Russian Federation by Vladimir Putin in 2007. Irving Lerner – an American film director, he was caught photographing the cyclotron at the University of California, Berkeley in 1944. After the war he was blacklisted. Alan Nunn May – a British citizen, he was one of the first Soviet spies uncovered during the Cold War. He worked on the Manhattan Project and was betrayed by a Soviet defector in Canada. His was uncovered in 1946 and it led the United States to restrict the sharing of atomic secrets with Britain. On May 1, 1946, he was sentenced to ten years hard labour. He was released in 1952, after serving six and a half years. Ethel and Julius Rosenberg – Americans who were involved in coordinating and recruiting an espionage network that included Ethel's brother, David Greenglass. Julius and Ethel Rosenberg were tried for conspiracy to commit espionage, since the prosecution seemed to feel that there was not enough evidence to convict on espionage. Treason charges were not applicable, since the United States and the Soviet Union were allies at the time. The Rosenbergs denied all the charges but were convicted in a trial in which the prosecutor Roy Cohn said he was in daily secret contact with the judge, Irving Kaufman. Despite an international movement demanding clemency, and appeals to President Dwight D. Eisenhower by leading European intellectuals and the Pope, the Rosenbergs were executed at the height of the Korean War. President Eisenhower wrote to his son, serving in Korea, that if he spared Ethel (presumably for the sake of her children), then the Soviets would simply recruit their spies from among women. Saville Sax – an American, acted as the courier for Klaus Fuchs and Theodore Hall. Morton Sobell – the American engineer tried and convicted along with the Rosenbergs who was sentenced to 30 years imprisonment, but released in 1969, after serving 17 years and 9 months. After proclaiming his innocence for over half a century, Sobell admitted spying for the Soviets, and implicated Julius Rosenberg, in an interview with the New York Times published on September 11, 2008. ↑ Allen Weinstein and Alexander Vassiliev, "Atomic Espionage: from Fuchs to the Rosenburgs" in The Haunted Wood, (New York: Random House Inc, 1999), 172–222. ↑ "Morris Cohen, 84, Soviet Spy Who Passed Atom Plans in 40's". New York Times. 5 July 1995. Retrieved 2008-07-07. Morris Cohen, an American who spied for the Soviet Union and was instrumental in relaying atomic bomb secrets to the Kremlin in the 1940s, has died, Russian newspapers reported today. Mr. Cohen, best known in the West as Peter Kroger, died of heart failure in a Moscow hospital on June 23 at age 84, according to news reports. ↑ Pace, Eric (January 29, 1988). "Klaus Fuchs, Physicist Who Gave Atom Secrets to Soviet, Dies at 76". New York Times. Retrieved 2008-07-07. Klaus Fuchs, the German-born physicist who was imprisoned in the 1950s in Britain after being convicted of passing nuclear secrets to the Soviet Union, died yesterday, the East German press agency A.D.N. reported. He was 76 years old. ↑ "Klaus Fuchs". TruTV. Retrieved 2008-07-07. His name was Klaus Emil Fuchs, and he was, as it has been shown by history, the most important atom spy in history. Not any of the notorious names in the saga of the theft of the atom bomb secrets Alan Nunn May, Julius and Ethel Rosenberg, and David Greenglass had been as important to the Russian effort as Klaus Fuchs. ↑ "1972 Death of Harry Gold Revealed". New York Times. February 14, 1974. Retrieved 2008-07-07. Harry Gold, who served 15 years in Federal prison as a confessed atomic spy courier, for Klaus Fuchs, a Soviet agent, and who was a key Government witness in the Julius and Ethel Rosenberg espionage case in 1951, died 18 months ago in Philadelphia. ↑ "Greenglass, in Prison, Vows to Kin He Told Truth About Rosenbergs". New York Times. March 19, 1953. Retrieved 2008-07-07. 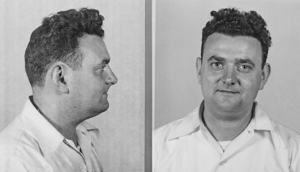 David Greenglass, serving fifteen years as a confessed atom spy, denied to members of his family recently that he had been coached by the Federal Bureau of Investigation in the drawing of segments of the atom bomb, or that he had given perjured testimony against his sister, Mrs. Ethel Rosenberg, and her husband, Julius. 1 2 Cowell, Alan (November 10, 1999). "Theodore Hall, Prodigy and Atomic Spy, Dies at 74". New York Times. Retrieved 2008-06-26. Theodore Alvin Hall, who was the youngest physicist to work on the atomic bomb project at Los Alamos during World War II and was later identified as a Soviet spy, died on Nov. 1 in Cambridge, England, where he had become a leading, if diffident, pioneer in biological research. He was 74. ... Mr. Albright and Ms. Kunstel say Mr. Hall and a former Harvard roommate, Saville Sax, approached a Soviet trade company in New York in late 1944 and began supplying critical information about the atomic project. ↑ "Alan Nunn May, 91, Pioneer In Atomic Spying for Soviets". New York Times. 25 January 2003. Retrieved 2008-07-07. Alan Nunn May, a British atomic scientist who spied for the Soviet Union, died on Jan. 12 in Cambridge. He was 91. ... One of the first Soviet spies uncovered during the cold war, Dr. Nunn May worked on the Manhattan Project and was betrayed by a Soviet defector in Canada. His unmasking in 1946 led the United States to restrict the sharing of atomic secrets with Britain. ↑ "Execution of the Rosenbergs". London: The Guardian. June 20, 1953. Retrieved 2008-06-24. Julius and Ethel Rosenberg were executed early this morning at Sing Sing Prison for conspiring to pass atomic secrets to Russia in World War II. ↑ "The Rosenbergs: A Case of Love, Espionage, Deceit and Betray". TruTV. Retrieved 2008-07-07. Julius and Ethel Rosenberg were charged with the crime of conspiracy to commit espionage, and tried under the Espionage Act of 1917. ↑ "Execution of the Rosenbergs". The Guardian. London. June 20, 1953. Retrieved 2008-06-24. Julius and Ethel Rosenberg were executed early this morning at Sing Sing Prison for conspiring to pass atomic secrets to Russia in World War II. ↑ "Morton Sobell Free As Spy Term Ends". New York Times. January 15, 1969. Retrieved 2008-07-07. Morton Sobell, sentenced to 30 years for a wartime espionage conspiracy to deliver vital national secrets to the Soviet Union, was released from prison yesterday after serving 17 years and 9 months. ↑ Roberts, Sam (September 11, 2008). "For First Time, Figure in Rosenberg Case Admits Spying for Soviets". New York Times. Retrieved 2008-09-11. In an interview on Thursday, Mr. Sobell, who served nearly 19 years in Alcatraz and other federal prisons, admitted for the first time that he had been a Soviet spy.